"Any time you can win a tournament at this level, it's a huge accomplishment," says defending champion John Isner. "I did it here in virtually my hometown. I couldn't have asked for anything better." After a sparkling debut last year, the Winston-Salem Open features an outstanding field for the final men’s-only event of the Emirates Airline US Open Series. 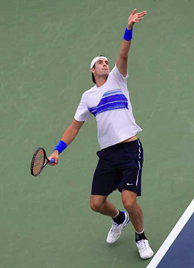 Defending champion John Isner, a native of Greensboro, NC, will be looking to extend his unbeaten streak in Winston-Salem after sweeping five consecutive matches last year. Top-five player Jo-Wilfried Tsonga and his French compatriot Julien Benneteau, who reached the 2011 final as a qualifier, have entered the tournament. Andy Roddick, a semifinalist last year, will be joined by fellow Americans James Blake and Donald Young in this year’s field. In June, Roddick captured the title at Eastbourne on grass to match Roger Federer’s streak of winning at least one ATP World Tour title for 12 consecutive seasons. The 48-player draw also includes Ukrainian Alexandr Dolgopolov, Kevin Anderson of South Africa and Spaniard Marcel Granollers. The inaugural WSO was last year, but the seeds for professional tennis were planted years ago. Tournament organizer Winston-Salem Professional Tennis Inc. was responsible for bringing highly successful U.S. Davis Cup ties to Winston Salem in 2001, 2007 and 2008. Donald Young, who improved his career-high ranking to 38 in the world earlier this year. The 22-year-old Atlanta resident posted solid results in 2011, advancing to his first ATP World Tour singles final and reaching the fourth round of the US Open. Even though the Winston-Salem Open is only in its second year, it has accomplished something no other outdoor tournament in the world has done: Fans will sit in comfort as all 4,500 seats on Stadium Court at the Wake Forest Tennis Complex are fully padded.